On behalf of The Law Office of William C. Wombacher on Tuesday, November 22, 2011. The medicating of Americans for mental illnesses continued to grow over the past decade, with one in five adults now taking at least one psychiatric drug such as antidepressants, antipsychotics and anti-anxiety medications, according to an analysis of pharmacy-claims data. 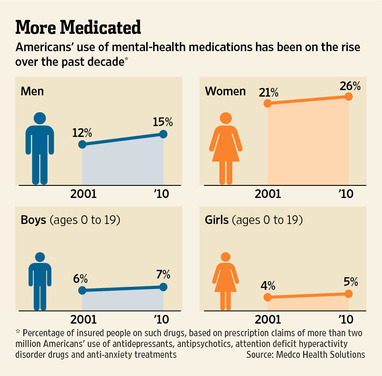 Overall use of psychiatric medications among adults grew 22% from 2001 to 2010. The new figures, released Wednesday, are based on prescription-drug pharmacy claims of two million U.S. insured adults and children reported by Medco Health Solutions Inc., a pharmacy-benefit manager. In the elderly, the use of anti-anxiety drugs, particularly ones that stay in the body for a longer period of time like Valium, is a major worry, but there has been relatively little in the way of research on their use in this population, according to Dr. Olfson. This new data about the 44% decrease in use of these drugs in the elderly represent a major shift in usage patterns in the last decade and are an "encouraging development," he says.